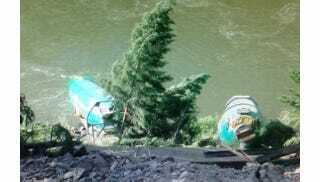 A train derailment near Superior, Montana sent two brand new Boeing 737 fuselages tumbling into the Clark Fork River on Thursday. The planes were on their way from Spirit Aerosystems in Wichita, Kansas to final assembly at Boeing in Renton, Washington. Montana Rail Link spokeswoman Lynda Frost said the accident occurred at about 4:00PM Thursday. "Those cars contained aircraft components, denatured alcohol and soybeans, most of which were the aircraft components. The crews have worked through the night, and it looks like that main line will be closed until tomorrow evening." Frost said three of the cars containing aircraft components slid down a steep embankment and ended up in the Clark Fork River. "Three of those loaded cars did end up in the river, and we're working hard to get those back up on the bank. The three cars containing denatured alcohol did not rupture, and as of this morning had already been offloaded to other cars. The shipment of aircraft parts originated in Kansas City and was headed for Renton, Washington." There has been no word on the cause of the accident, or which airline these were destined for, but it's likely these planes are damaged beyond repair. I'll update this if or when more information is released.